Star Trek Timelines is a free-to-play mobile game that reaches it's second birthday next month. I've been playing since the soft launch, so I've seen and felt the impact of its growth and developer Disrupter Beam's responses to the ever-shifting mobile game landscape. As a free-to-play game, STT wants players to return to the game on a frequent basis over a long period of time. The longer the player enjoys the game, the more likely they are to make a purchase. Incentivised advertisements provide a secondary income, pulling money in from both paying and non-paying players. The core loop of the game is to earn crew cards and use them to play missions which reward the player with items, allowing them to improve the crew to complete new missions. It's a simple loop, supported by a number of features and mini games to appeal to a wide audience. You can never disregard the power of a franchise. I've always been a Trek fan on TV, and licenced games have been a staple of my lifelong game library. In fact, the only MMO I've really put any time into is Star Trek Online. Timelines makes great use of 50 years of the franchise, pulling in characters, ships and locations from almost every TV series and movie. But just sticking a Star Trek name on something isn't enough. For example, there's another Star Trek game on mobile, one that I've tried but hated and never played again: Star Trek Wrath of Gems (groan). It's a fairly typical Puzzles vs Dragons match 3 game, where you match colours to have characters perform attacks against an AI enemy. It failed to hold my interest for more than a couple of minutes because it's a game type I've played time and time again wrapped in other franchise's clothing. Timelines feels like it was made by fans who know the stories and the characters inside out and have made something that perfectly ties into them. It doesn't feel like a new coat on an old idea. So yes, the number one reason I'm playing Timelines is that it's a Star Trek game. That's what attracted me to it in the first place. But if it wasn't for the following reasons, I would have dumped it just as quickly as Wrath of Gems. Remember the old tagline of Pokémon? "Gotta catch 'em all." It perfectly summed up the goal in the first generations of the portable RPG and the anime. It's such a simple idea too: give the player a large number of relatable items to collect, be it cute and powerful animals or your favourite Star Trek characters, make them varying degrees of difficult to find and collect, and then create a supporting story and game around them. There are a number of characters here that you can win or purchase. As a long-time player, there is a mix of old and new ones. The guy with the melted face? That's Mirror Universe Tucker and I already have him. What's more, I have him Immortalised, which means I have him completely levelled up and finished. So earning him only benefits me by recycling him for some currency. But look at Mirror Data! He's a brand new character in the game. He's not canon, he's been designed by Disrupter Beam and he looks so damn cool. I want him. Of course, he's a high-level reward because he's that cool. I'm very, very unlikely to get even a single copy of him. And I want more than one. He's a five-star character, which means I need five copies to make him the best he can be, and very useful in the game. It makes those purchase options awfully tempting. This screen also shows two in-app purchases for the hard currency Dilithium. I'm very unlikely to get a Mirror Data in either of those, but it's possible and I'll come back to that soon. 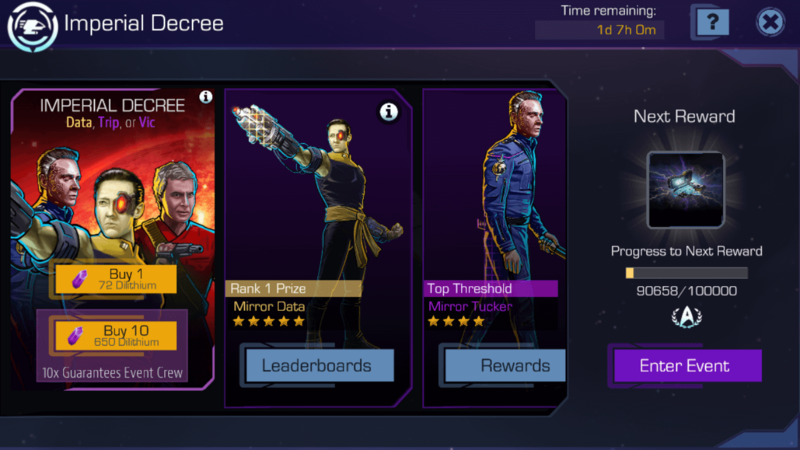 Instead, I can pay a one-time fee of $100 to get two copies of him, plus some extra Dilithium packs to bump up the value. Very tempting. And this happens every weekend. There is a constant stream of new characters coming into the game, the vast majority of them being four and five star, so there's a constant push to collect them all. Also, you have limited crew space. Once you've levelled up your character, grinded for and given them all their items and hunted and waited and spent to fuse them up to their maximum star, you can immortalise them. This is essentially frozen storage, allowing you to free up space for new characters while being able to withdraw stored ones for a small soft-currency fee. Think the PC Box in Pokémon, except you have to work to store them in there, and pay to get them out. After two years, though, things have gotten difficult. 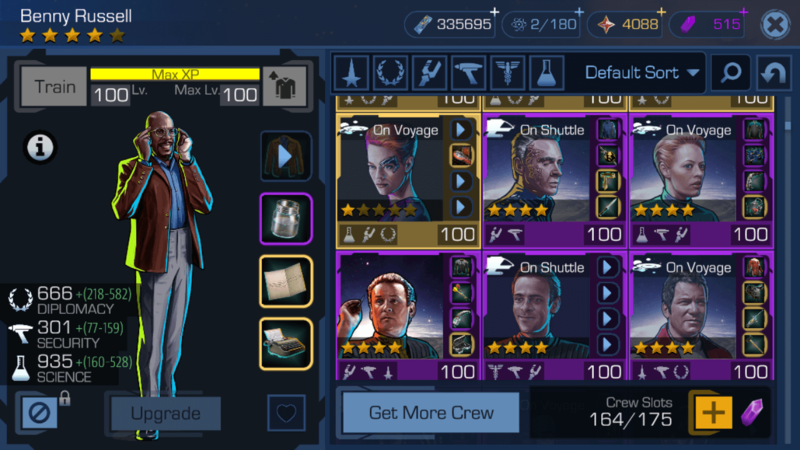 I have collected every single 1, 2 and 3-star crew member, maxed them all and stored them. That leaves me only with the difficult 4 and 5-star crew which are an absolute grind, and the game now feels far less rewarding. My short, easy rewards are harder to get, but now the big rewards are more powerful. Like every free-to-play game that knows what it's doing, Star Trek Timelines has a number of daily activities. You log in several times a day, complete them all and you build up currency to spend on your characters. That's the daily loop and the daily grind. That gets old pretty damn fast. So one of the big retention features that keep me logging in is the weekend events. Every weekend, as stated above, the developers introduce a couple of new characters. 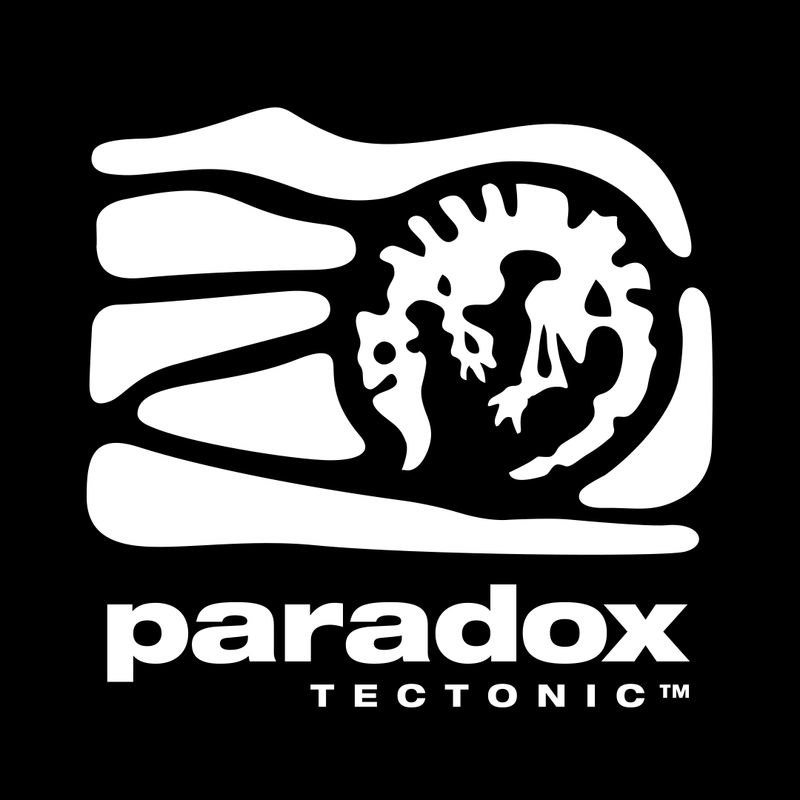 It also runs a story based event, where something is happening in the game world that you, the player, can assist with. Some months, they even tie together several events in a nice little narrative. This month it's the Mirror Universe, meaning that all the Mirror Universe characters you've collected become extra useful this month, so get them out of storage. There are several types of weekend event. Some only ask the player to log in every few hours to collect crew from automatic Shuttle Missions and sent them off again, others require the player to replay missions to grind for items to spend on creating event unique items crafted for small pieces of narrative and to boost your score. Some events combine the two. Regardless of the type of event, each weekend there are new characters, a different kind of daily grind and new snippets of story to expand the game. But what about the story? Or the space combat? I long ago stopped playing the game for the story. It's got a pretty smart premise: time portals are ripping time and space apart, throwing all characters and ships into your universe allowing you to build up your crew from all Trek series and try to discover and stop what's happening. It's also got the same problem EVERY free-to-play story has: it never ends. Unless one day the game becomes very unpopular or Disrupters Beam's contract is up and the game shuts down, there will be no end to it. There are no twists, no thrilling narrative, no real development. We will never know why the portals opened, or how to stop them. The story that is added each mission or every weekend is completely inconsequential. It simply doesn't matter. The story is an excuse, and no more than that, for why you can send Kirk on a mission with Janeway. The premise, while smart, is simply the lantern to wave away the question of why they are all there. If you watch the trailer, the space combat looks great. Ships are ducking and diving, firing bright phasers and torpedoes with all the correct TV show colours and sounds. But in actuality after the first few battles, it gets really dull. Your ship flies around and attacks all by itself. You can choose crew members with their own abilities, and activating them is where the real damage is done. But after two years of having to do ship battles to get my daily rewards, I'm so bored of it. I now start the battle rolling and put my phone down for 30 seconds, picking it up once I've been destroyed. But for a free to play game, I don't want anything more engaging than that. If I had to participate more in the battle, I'd get very frustrated trying to reach the goal. It's dull, but it's not frustrating. Star Trek Timelines is a game that typifies the era of mobile gaming we are in. The gameplay is bitesize, meant to be played in short spurts several times a day. The engagement is meant to be a long-term, slow grind that deals out small rewards frequently to encourage the player to really work for, or pay for, those big payoffs. So is it worth playing? For me, I can log in each day, feel good and come back again and again. Of course, there are many thousands of people playing, and each gets something different out of it. Some enjoy the space combat and trying to figure out which characters make the best strategy to move up the leaderboard. Others enjoy the social gameplay of pushing their fleet ever higher. A game like Star Trek Timelines has a platter of game features to appease a wide variety of people. As a free-to-play game, the success is defined by it's continuing income, rather than ratings or awards. As such, it needs to appeal to as many people as possible to bring them back day after day, month after month. And like most free to play games, as long as you only think about each session as you play, it feels valuable. Story additions for an event are cool, but when you start to consider the game over the long term, you begin to question what value it gives you. Is it entertaining? An I enjoying this, or an I being manipulated? Does it matter?